Complete. Ask for pictures if you are interested. Discs in excellent condition. Cover, included OBI and insert in excellent condition. Always ask for pictures. With obi. In great condition. A couple of finger marks on the obi. Apart from that, pretty much as good as new. Very nice condition with OBI and gatefold. You will not be disappointed. Ask for pictures if you are interested. 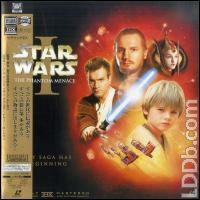 PHANTOM MENACE,SW.ep:1,JAPANESE RELEASE APRIL 07 2000.WIDESCREEN.DISCS w/MODERATE HAIRLINES,CLEAN/CLEAR.GATEFOLD/OBI STRIP MUSTY SMELL.6cm SCRATCH ON FACE. BLEMISHING ON TOP EDGE. NO CORNER JAMS,CREASING,OPENING WEAR,OR SEAM TEARS NOTED.